This week I found myself coaching a few folks on the same issue-unproductive competition. For each of them, this showed up in the process of comparison to others. All of women could not be more different if they tried with respect to their professions, cultures, age, academic backgrounds, and I could go on and on. Interestingly enough, though, as they were sharing specifics around the different situations they were facing, they each started to compare themselves to others in the same areas of focus as themselves. Essentially, they each pointed to the fact that they “really have to do better than so and so” or just kept “thinking about so and so who has been doing this for so long and I don’t know if I can be as good”. The most junior person was so consumed by this that I had to stop and ask how this mode of operating would benefit her if the targeted competition that she was pointing to as motivation for achievement would all of a sudden disappear? Complete silence. See what this highlights is that if your motivation is solely tied to the presence of someone running on the same track as you, if they all of a sudden decide to either switch to a different sport or drop out altogether, you’re more than likely either going to loosen up your game or even follow their lead and quit altogether. This is where Carl Lewis’ lesson is so pertinent. In this game of life, if you’re living just to live longer than all the other “livers”, as soon as you see one obituary, you’re done (yup being a bit bold here today). Now, I learned a looooooooooooooooong time ago that perfection should never be the goal. In fact, I remember the first time this actually clicked for me-Boston College Shaw House, Fr. Lahey, 2001…another story for another day, but it was the first time that I’d heard that “the pursuit of perfection is the enemy of the good.” This was the first time that I understood the value of the mindset around BC’s motto-‘Ever to Excel’-and truly embraced it (I so didn’t mean this to be all about BC). So what I take away from Mr. Lewis’ competition against perfection is not that we must set the goal on perfection, but instead, on the challenge perfection presents, the opportunity it serves to us to be the very best we can be, do the very best we can do, regardless of who is on our left, on our right, ahead of us, or even behind. So I say we embrace competition but we proactively check ourselves to be productive and compete not against others, but toward our best selves. For a daily reminder of this, we need do nothing more than take a moment to look at a flower and reflect on the fact that even nature understands and operates this way. 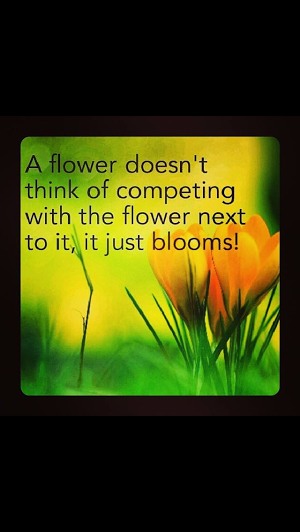 How will you blossom today?